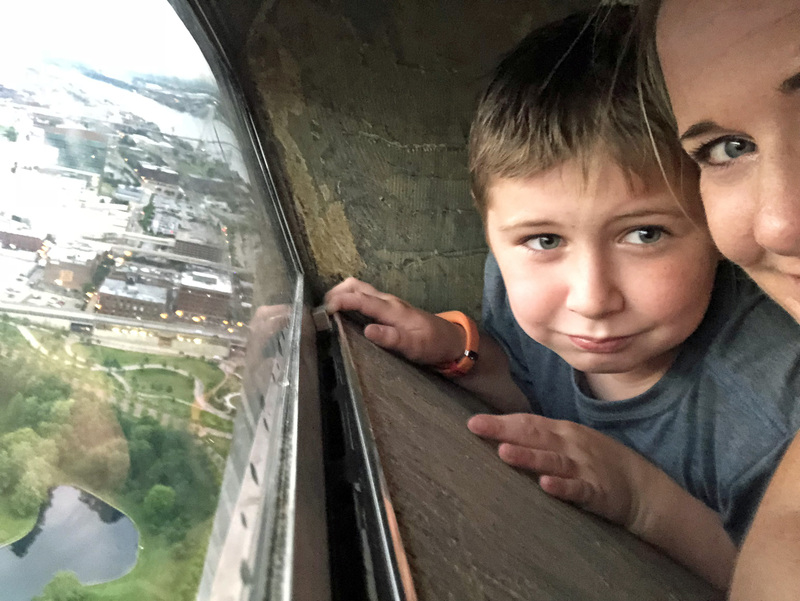 Weeks before, we’d seen friends share photos of a summer trip to St. Louis including a stop at the St. Louis Science Center and a special exhibit featuring the Apollo 11. 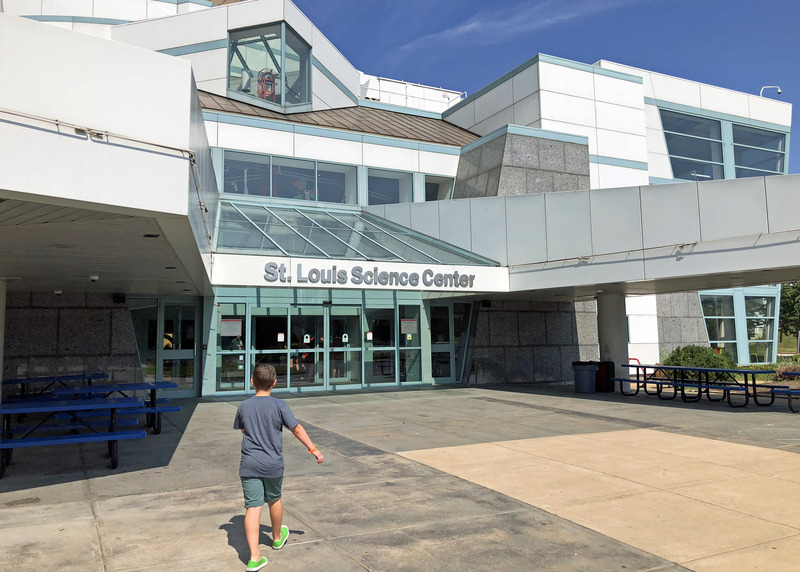 I looked it up and the Apollo 11 exhibit is doing a small tour to science museums around the country and St. Louis is the closest it would be to us — and it would only be there for another 6 weeks or so. A quick look at the calendar confirmed school and football were coming quickly, and we better take advantage of the next open weekend — so we did! 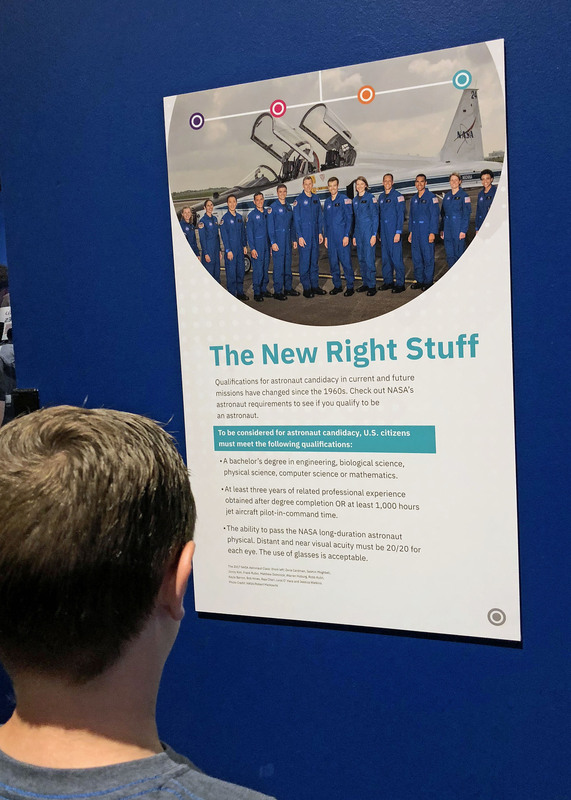 Colt is all things robotics and engineering and SPACE these days, and with something like that within a weekend’s drive of us — it was perfect. 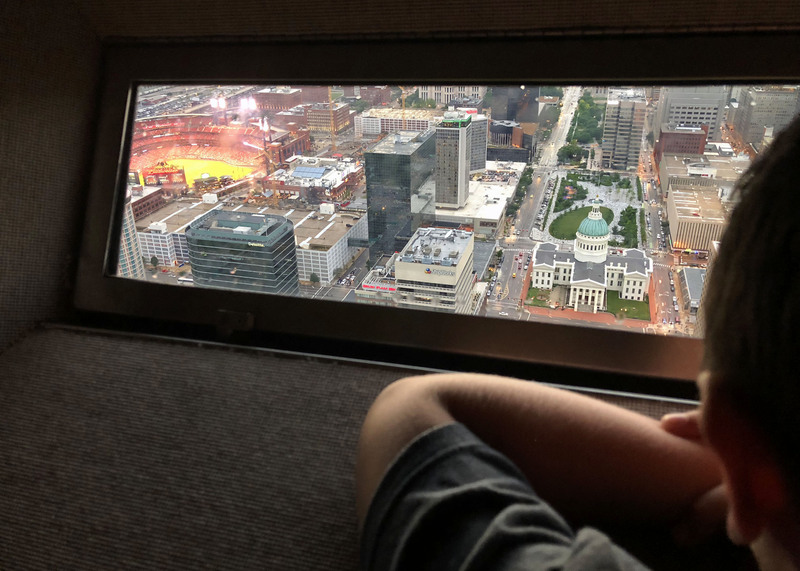 We left town after work on a Friday and crashed into bed at a hotel in St. Louis LATE that night — but looking forward to a full day of moonwalking, and any other adventure we could find. I know I sing its praises every chance I get — but the ASTC is worth every penny. The ASTC is the Association of Science-Technology Centers and if you’ve got a membership to one of the ASTC museums on this list you get benefits (like free admission!) to museums all over the country. 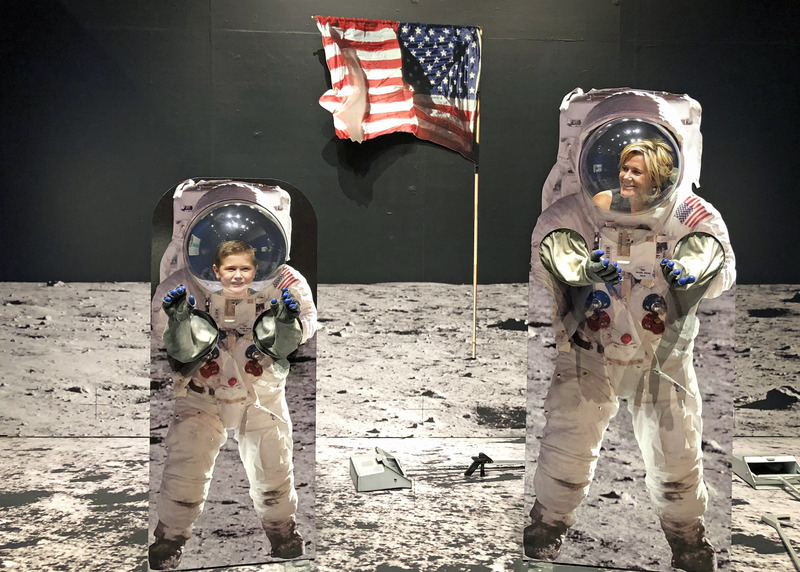 We used our Amazeum (NWA museum) membership to get free admission to the St. Louis Science Center, free parking, and a discount off the Apollo 11 special exhibit tickets. 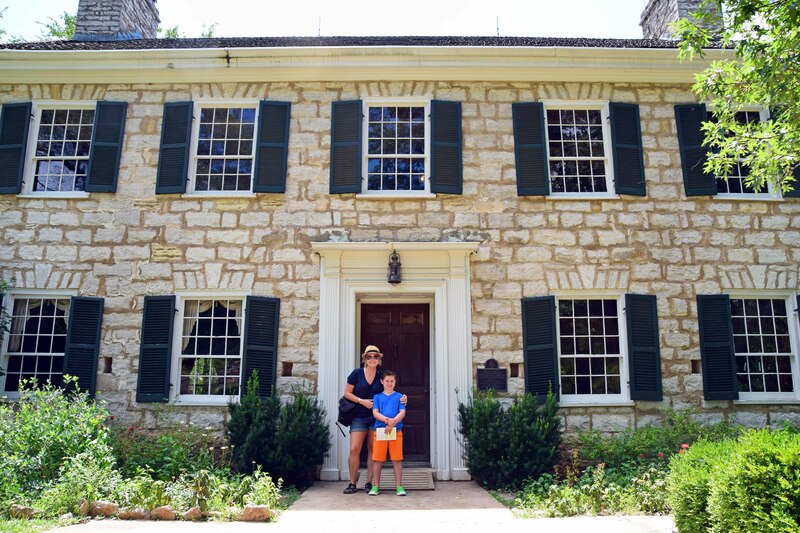 We’ve now used our one membership to get free admission to museums in 5 different states! Honestly, I feel like Colt is the one who should tell you about this. He was dazzled. 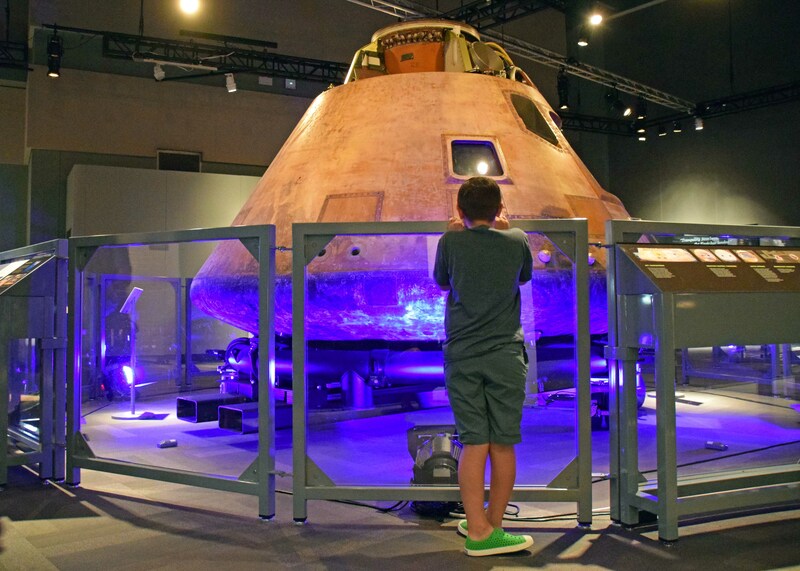 Not only did he get to check out the command module that orbited the moon but they had other artifacts and rooms upon rooms of stories from the astronauts and from the space race culture at the time. Space isn’t even my thing and it was fascinating. One of the rooms within the exhibit had a simulated command module (the part that orbits the moon while the astronauts walk on the moon), lunar module (the part that lands on the moon), and Mission Control (the guys in Houston, Texas that help the astronauts from Earth). (I’ve learned enough to keep up with him, but don’t quiz me.) There was a working sound system in the different interactive sections so kids at the Mission Control desk could talk to the kids in the lunar module, and so on. Colt could have stayed there ALL DAY. He quizzed me about Space Camp all the way home the next day so maybe we’ll just start there! 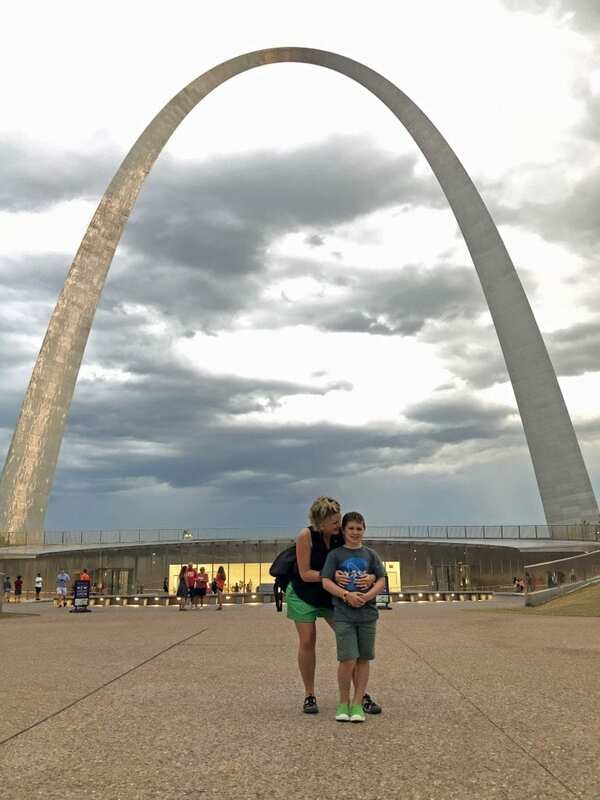 Our number one mission for the weekend was to see Apollo 11, but — the National Park junkies we are — we headed over to check out the Arch Saturday afternoon after we finished up at the Science Center. 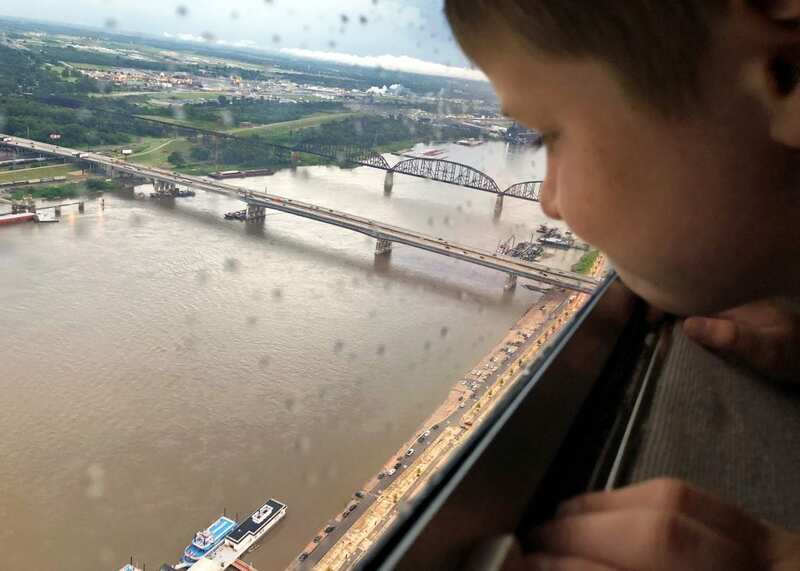 My family went to the Arch on a Spring Break trip when I was a few years older than Colt, and we’ve had it on our list of weekend trips for a while so I’m glad we finally made it over there. 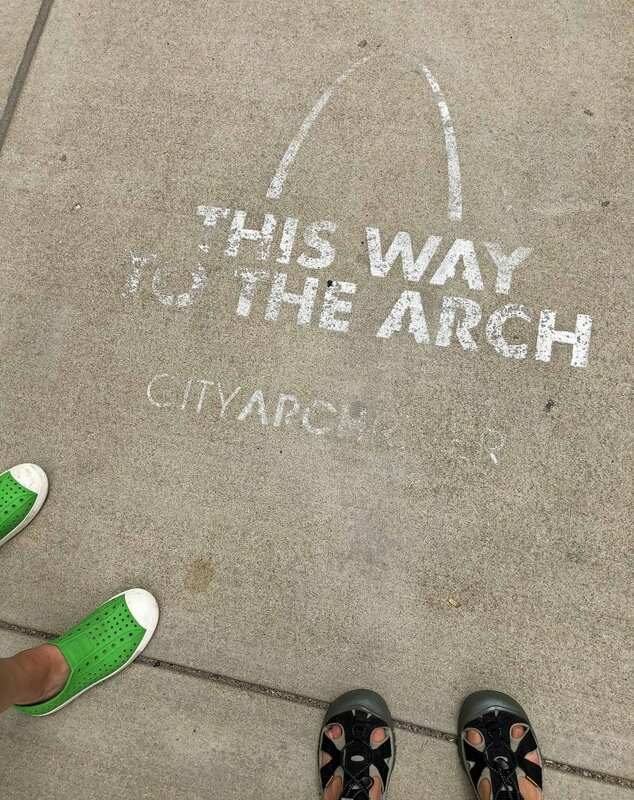 And it turned out to be perfect timing — the museum under the arch had just reopened days before we arrived! 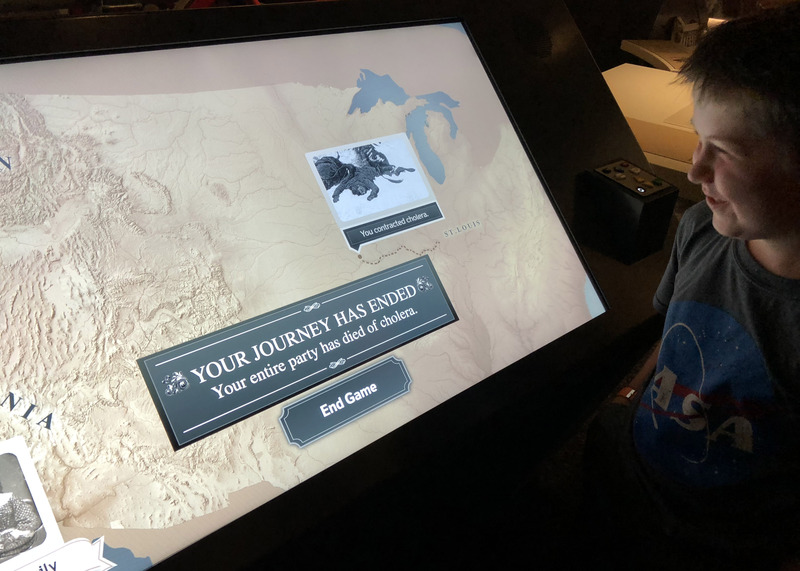 The Museum of Westward Expansion is WOW. We couldn’t see it all. I usually plan better and have tickets and arrangements made, but since we hadn’t made plans ahead of time to be there that afternoon, tickets to the top were sold out for a few hours — so we had plenty of time in the museum, we watched a film about the engineering of the Arch (which still boggles my mind), and even had time to take a boat ride up the river for more stories and a beautiful view of the Arch from the water. 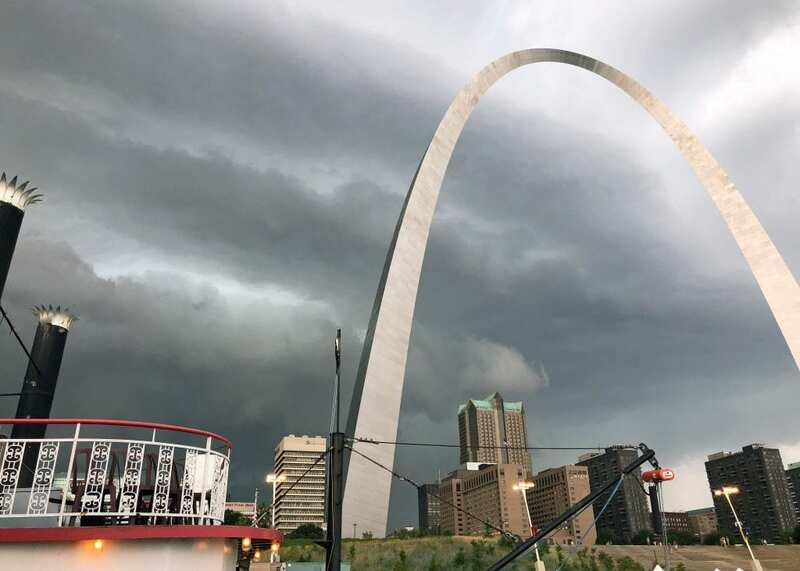 And as our boat was chugging it back down the river to the Arch, the sky starting getting a little ominous. I pulled out my phone to check it out. YIKES. As we docked, people were urgently lining up to get the heck off that boat and find a dry place to hide. 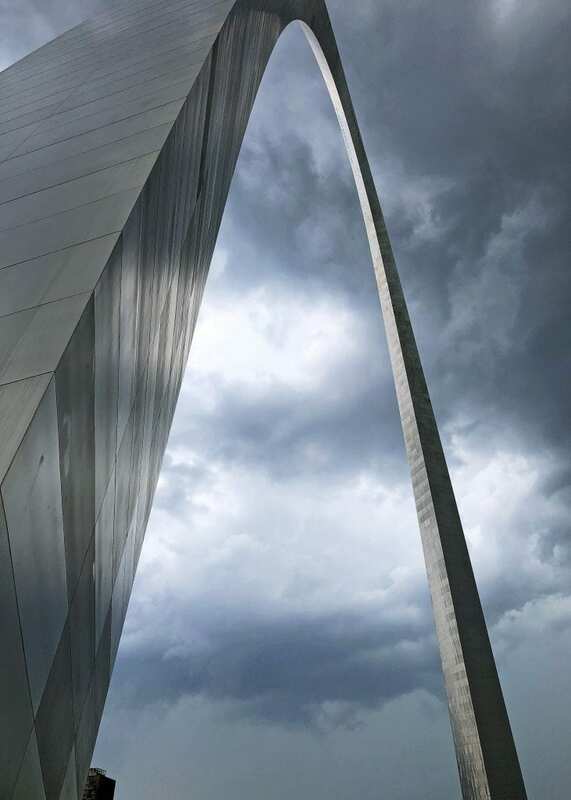 We made it to the steps below the Arch when the sky absolutely opened up and it POURED. We were running in a stampede of tourists across the grass under the Arch, trying to get back to the door of the museum and safely inside. We were SOAKED. But hey. It cooled things off! The temperature dropped nearly 20 degrees with all that crazy rain, and it didn’t last long. I was worried we wouldn’t be able to use our tram tickets to the top with bad weather — but it cleared up and it was our turn! A long and rainy day that started out on the moon and ended with a trip through the gateway of U.S. history. 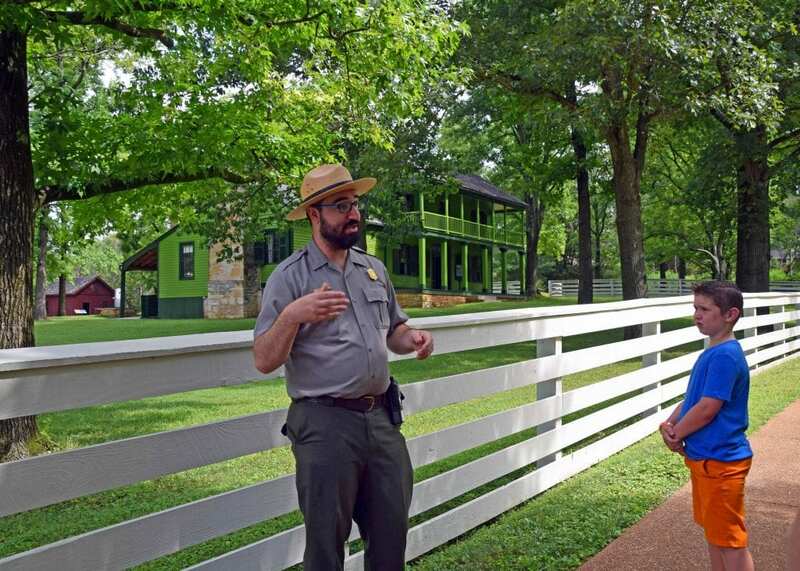 We were headed home Sunday but we knew we had time to make a few quick stops on our way out of town — and the National Park Passport let us know there was another site in the St. Louis area. 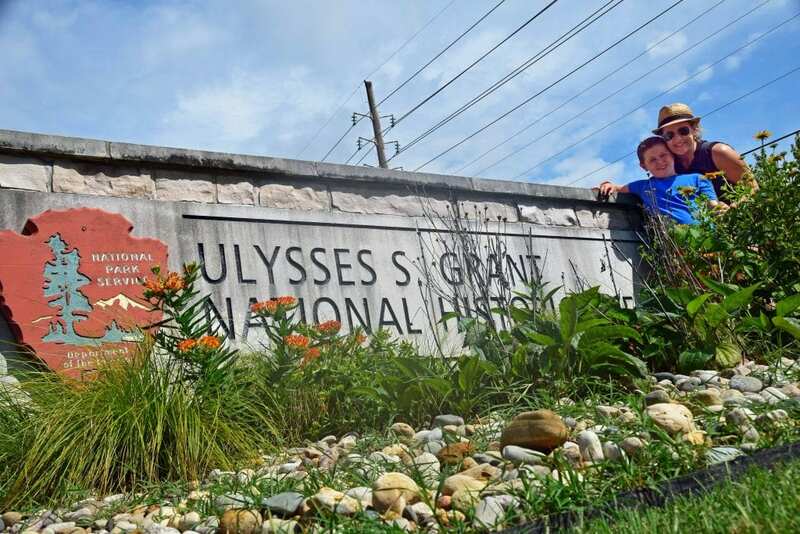 So to the Ulysses S. Grant National Historic Site we went. Two years ago, Colt and I visited the General Grant Memorial in uptown NYC and we recently visited West Point this winter — and we TRIED to visit the Grant Monument in DC a few years ago but it was all boarded up for restoration. You could say we’re Grant fans. And that was even BEFORE Colt knew Grant lived in a bright green house! I assume they get a lot of questions about it and they’ve smartly dedicated a corner of the site to explaining the paint color. 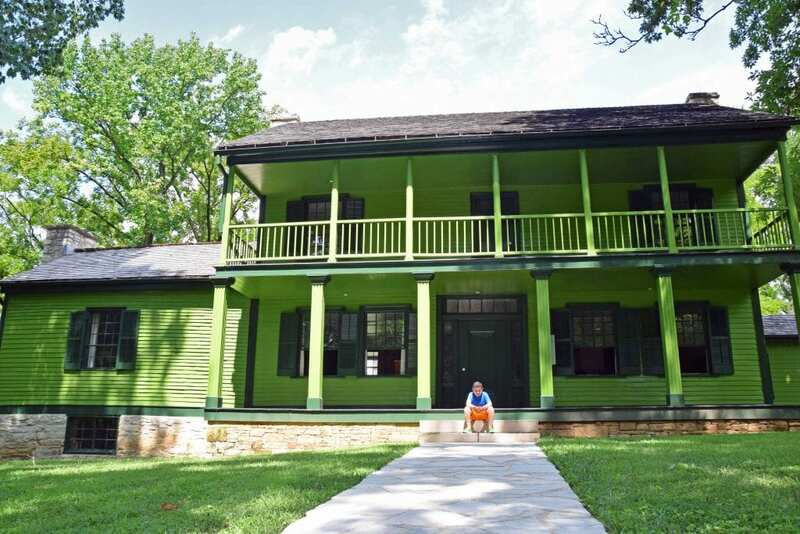 White Haven is the home Grant’s wife Julia Dent’s family originally owned. Grant’s West Point roommate was Julia Dent’s brother Fred. Grant met and fell in love with her here at White Haven when he went to visit. 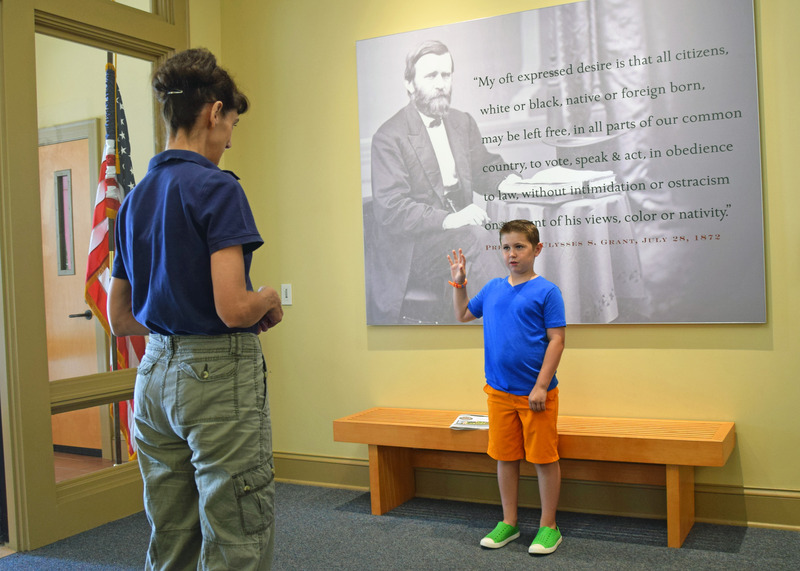 The museum and grounds are dedicated to stories of Grant as a family man — not necessarily as a general or a president. It was neat to hear that part of his story, most of which was new to us. One last stop! I mentioned to a friend at work we were headed to St. Louis for a quick weekend and he suggested Colt might like seeing Daniel Boone’s home. And oh my goodness, what a hidden gem! Daniel Boone was a pioneer and folk hero and while this place is not a NPS historic site, it is truly a piece of history. The house is beautiful! We took a tour with another couple visiting and heard stories of Daniel’s 10 children and dozens of grandchildren (many of whom lived in the house!) and his hunting trips and his relationship with nearby native tribes. 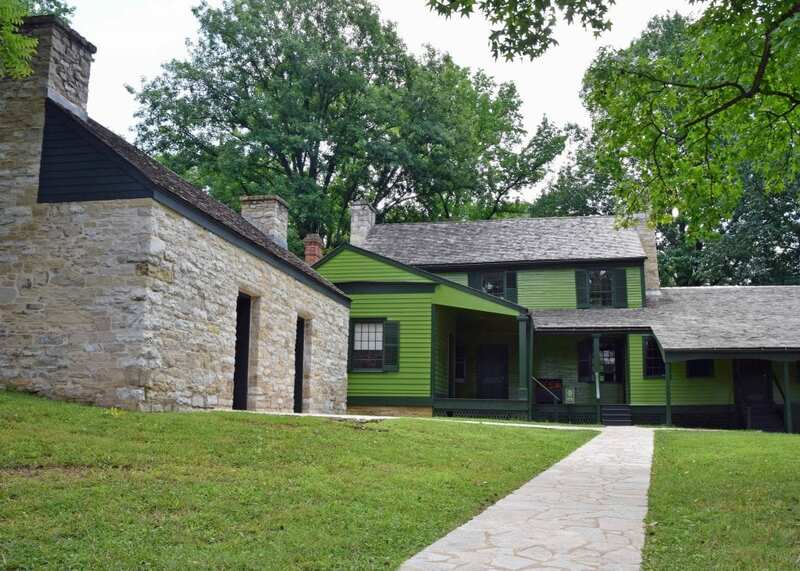 The house has been largely restored and so many pieces are original. 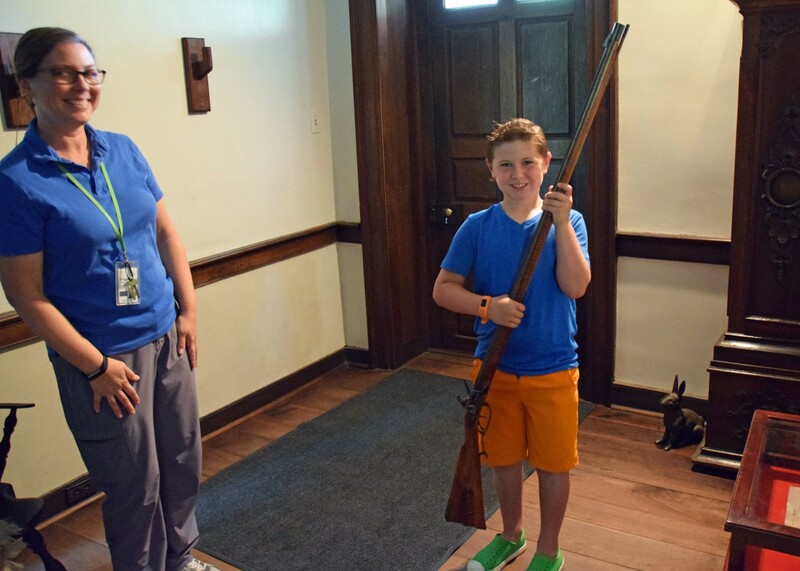 As we passed through one of the rooms, Colt motioned toward a rifle on the wall and said something about it being heavy — so our tour guide reached up and handed it to him to prove that YES! It was! Tough to take a photo of, this was one of my favorite parts of the house. 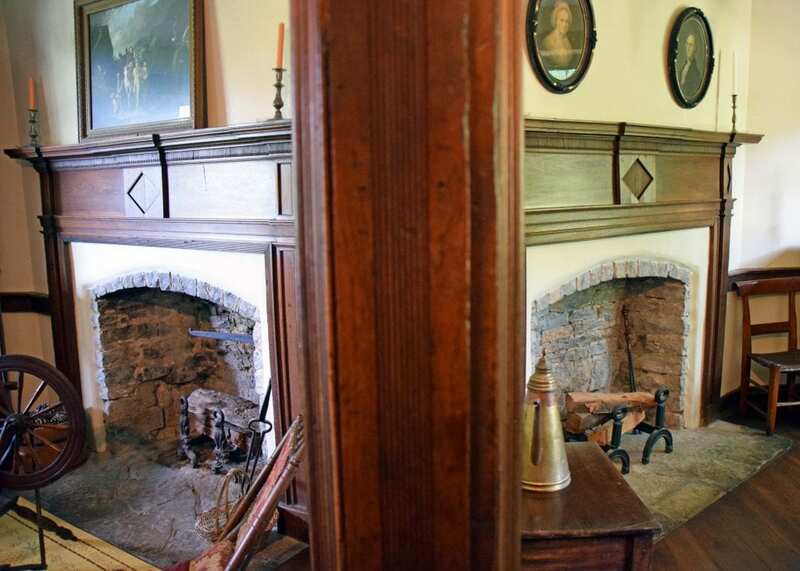 The fireplaces in these two bedrooms are built on a diagonal so they face into each room — and they share a chimney. So smart! Beyond the house, the grounds are being developed into a learning center. 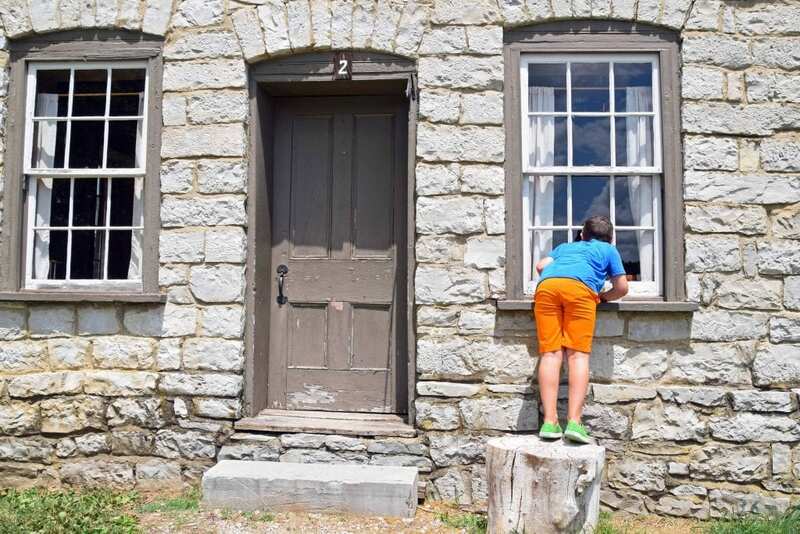 We were able to take a self-guided, walking tour of over a dozen buildings placed on the property from nearby locations — to form a little town used for school groups and camps. There was a schoolhouse and a church and a blacksmith and a general store and several little homes. After our walk around “town” we were hot and tired and ready to get on the road. What a fun little detour! 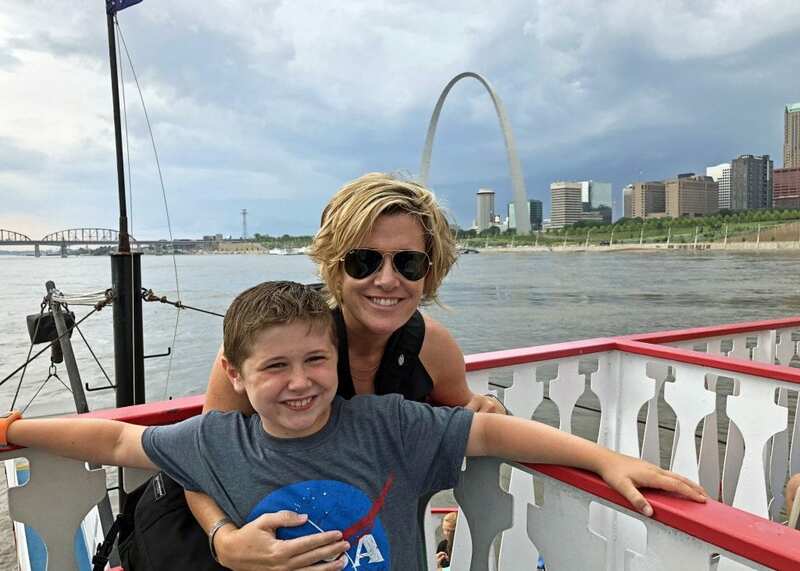 What a fun weekend, St. Louis! It was a quick one, but packed with science and history — just what we were looking for. Until next time! Sounds like you guys had an awesome trip! 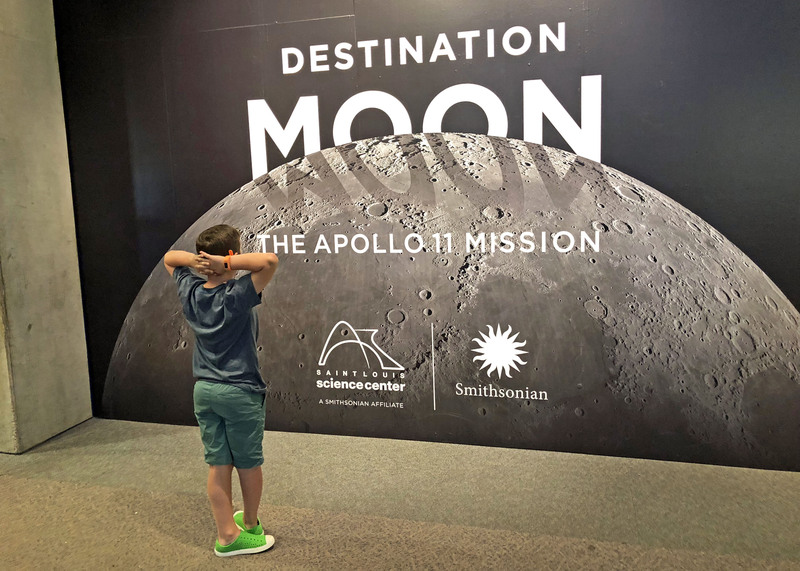 We went to the St Louis Science Museum last summer and the admission was free, but I’m guessing the Apollo exhibit is what required a pass/admission. So many cool other stops too! I will definitely keep these places in mind. Hey there! Yeah, admission has been free for us every time we’ve used our Amazeum membership, but if there’s a special exhibit – that’s not free. But we usually get a discount! It’s such a great deal. I try to tell people about it every chance I get because I had no idea for the first year we had it.